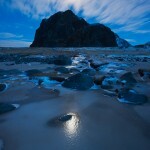 This weeks Friday Photo is more illustrative rather than scenic in purpose. 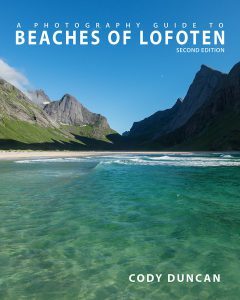 This photo shows that Lofoten is not always a winter wonderland of white snow from sand beach to highest peak. There is actually a fragile balance between snow and rain that has a rather dramatic effect on the appearance of the landscape, and in turn, what photographic opportunities you will find. With a fresh layer of snow, most anything is photogenic. When the snow line retreats up the mountains, the low areas can often look bland and lifeless. Despite the northern latitude of Lofoten, the winter temperatures remain quite mild. For several days previous to this photo a southwest wind brought the temperatures above the freezing level, while rain melted away the snow. Finally reaching a high of 6.2˚C, which might not sound like much, but it was February in the Arctic Circle. And for another reference, the high temp on June 1st, 2012 was 6.5˚C, while June 1st, 2013 reached a high of 26.3˚C. What an amazing variation! 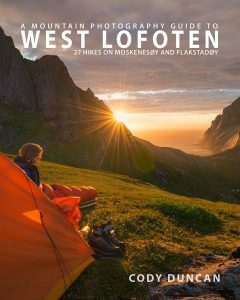 Lofoten weather is unpredictable at best, and years seldom seem to repeat themselves. In fact, the weather almost makes a point of being completely bi-polar year upon year. When I passed by this scene a few days earlier, the lake had been covered in a nice coating of snow. 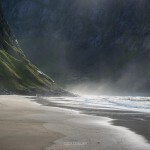 On this morning, I passed by once again on my way out to Haukland beach to see if I could find something interesting. 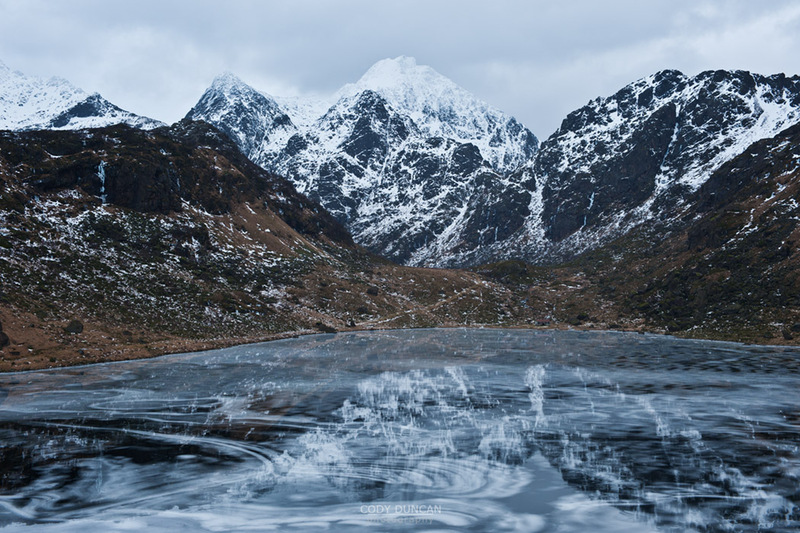 Now, a layer of rain water covered the ice, allowing for a reflection of the mountains. And in combination with the freeze patterns in the ice, created some interesting texture. The light was a bit flat, but what can you do. I was glad it had actually stopped raining for a few minutes.